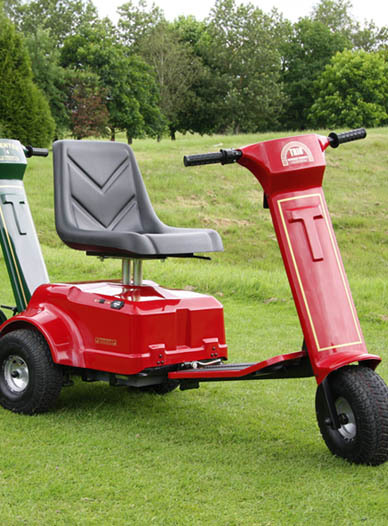 The official website of the amazing Patterson Products ‘Trio’ range of hand-built mobility golf buggys. on all buggies sold this April.! 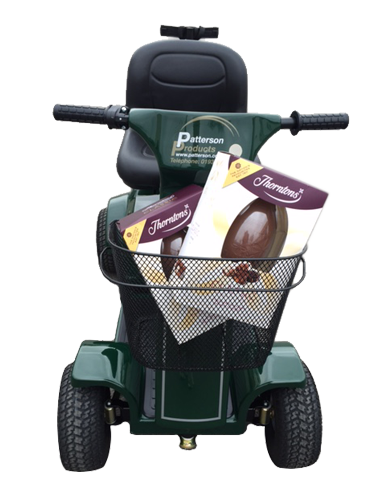 ..FREE Basket (and Easter Egg)..
We have been manufacturing the finest quality buggys for thirty years from our factory in Chertsey, Surrey. Super simple to operate, the Trio Original folds/breaks down and fits into most car boots and helps you enjoy a full 18 holes of golf a day. Sit back and relax in the sprung seat as you drive between holes, conserving your energy for when you really need it – playing your shot. Variable speed control with forward and reverse gears give maximum maneuverability and the Trio is stable, reliable and virtually maintenance free. Once familiar with the buggy, it can be assembled/disassembled in under two minutes. 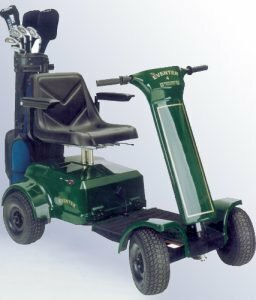 So, if you need that extra mobility and are interested in extending the enjoyment of your golfing life, a Patterson Products mobility buggy is an obvious choice. Get around for years to come! Major suppliers to the handigolf foundation A chariable trust for the handicapped golfer. Bringing style to the golf course! Plus Patterson Products two year parts and labour warranty. 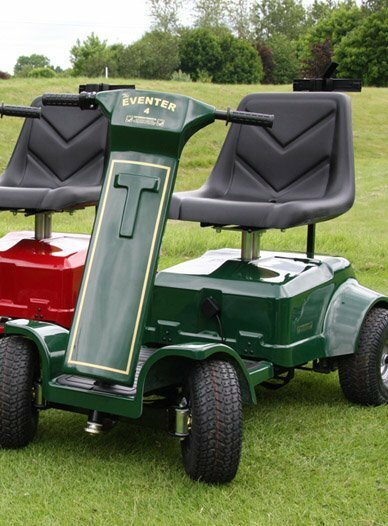 Added to the range for the year 2000, the Eventer golf buggy has since thoroughly proven itself as an off-road mobility cart. This dual purpose machine was designed in conjunction with the Event Mobility charity (hence its name). The Eventer provides a mobility solution where traditional vehicles struggle to cope and has been extensively tested throughout the 1999 season at various open air events. 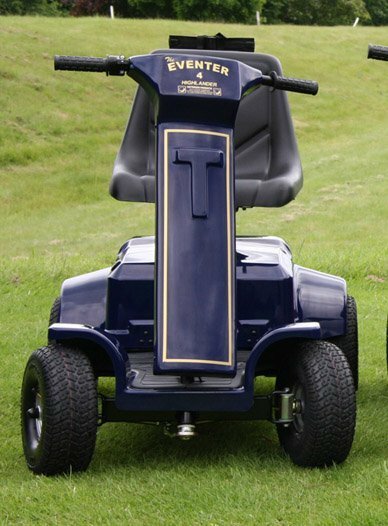 With generous ground clearance, wide turf tyres and a proven drive train based on the Trio golf cart, this vehicle is equally at home at the Windsor Horse Trials or the golf course, where Patterson Products golf cart expertise becomes apparent. The Eventer allows for convenient transportation and storage, as the machine can be quickly dissembled and stowed in the boot of many cars, with the heaviest section weighing just 22Kg (approx 50 lbs) and the ‘gel’ batteries making for safe, leak-free transport. Highlander fits into most large hatchbacks, estates and larger saloon car boots and helps you enjoy a full 18 holes of golf a day. Highlander models are available in both 3 and 4 wheel versions. They are essentially up-rated versions of the popular Trio original and Eventer4 and specifically built for the most demanding of courses and arduous use. Visually, they have wider rear track and under the hood, benefit from 2x 70 amp/hr dry cell batteries. The Highlander will more easily climb steeper hills and navigate rough terrain. All our vehicles have been superbly engineered allowing you to assemble and dismantle easily in under two minutes and they will fit into the boot of most family saloons. Patterson Product’s Trio Professional is currently the buggy of choice at Henley Golf Club, The Roehampton Club, The Royal Automobile Club, Prestwick Golf Club and St Georges Hill Weybridge to name but a few! The Trio Professional Golf Buggy is an upgraded model designed for heavy use and so particularly suited to the rental market. 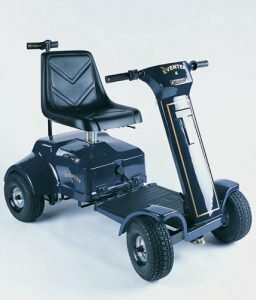 With a wider, reinforced chassis, more powerful motors and driven by heavy duty batteries, the professional is easily capable of two rounds of golf, around even the toughest courses, between each battery charge. 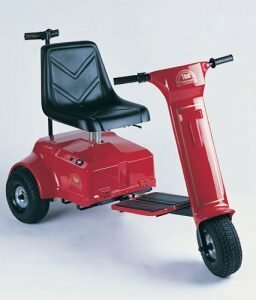 The six and a half inch wide tyres are kind to the course, while the sprung seat with (optional) arm rests, and electric drive provide superb comfort for the rider. Price includes batteries and fully automatic battery charger which switches itself to a maintenance mode to prevent overcharging.